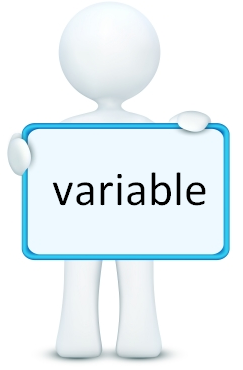 A variable is something that varies – a factor that changes. Variables can be things like a person’s race or gender, the type of weather going on at the moment or the time of day, or what sort of exam results different people get or their scores on tests. In an experiment, a scientist will focus on a particular thing they’re interested in – the independent variable (IV). This is the topic the scientist is exploring, the thing that might be the hidden cause of behaviour. Manipulated IVs are things that the scientists can change in order to see what happens. For example, a scientist could change how noisy a room is to see if people worked harder or not. Another example of a manipulated variable might involve testing a drug on one group of people while leaving another group normal. A naturally-occurring IV is something that changes of its own accord. For example, no scientist can “make” people male or female. Sometimes it’s physically impossible to manipulate a naturally-occurring variable. Sometimes it’s just unethical – for example, it would be wrong to give someone a nasty disease just to see how they coped with it. Experiments investigating naturally-occurring IVs are natural (or quasi-) experiments. These are much weaker, with lower internal validity, although they may have higher external validity (because the IV is one that chabnges in real life). In an experiment, a scientist will be looking for a certain type of result. 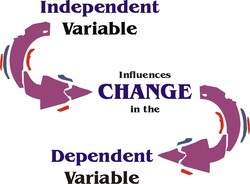 The dependent variable (DV) is the thing that changes – the outcome that you measure. In a successful experiment, changes in the IV should cause changes in the DV. Remember how science tries to discover laws and make predictions? That’s the beauty of experiments; they show causation - cause-and-effect. If your DV changes at the end of an experiment, you can conclude that the IV was causing it to change. Operationalising means stating your IV and DV in ways that make it obvious how they are being manipulated or measured. In particular, an operationalised DV will create quantitative data. Not "role models" but "aggressive role models" and "non-aggressive role models"
Of course, you can’t always tell cause-and-effect from an experiment, especially an experiment on people. This is because the IV isn’t the only thing having an effect on the DV. Usually there are lots of other factors going on too. Factors other than the IV and the DV that might change during the course of a study are the extraneous variables. Participant variables are differences between the participants themselves. Obviously, everyone's different and most participant variables (height, birthday, number of siblings) don't make much difference to a study, but others (intelligence, level of education, personality) might make a big difference. Situational variables are changes that occur in the situation the participants are in. This includes things like the weather and heat, how crowded the room is and the time of day as well as "outside interference" like interruptions or distractions (a fire alarm, for example). Experimenter effects are changes the experimenter makes, usually without realising it, by treating some participants differently from others. It's a form of bias and it often involves encouraging participants to act or respond in a particular way through body language or tone of voice. Most extraneous variables make no difference or even cancel each other out, but they "sow seeds of doubt" about whether the DV is really being caused by the IV - they lower the internal validity of the study. Some extraneous variables definitely make a difference to the behaviour of participants and interfere with the DV. These are called confounding variables because they confound (spoil) the validity of the research. To deal with the problem of confounding variables, scientists will use experimental controls. A control is something that stops a confounding variable from interfering with the DV because it makes sure that the only important variables changing are the IV and the DV. It's much easier to set up controls for extraneous variables in a lab experiment, because everything is taking place in a controlled setting that you can arrange beforehand. In a field experiment, it's harder to set up controls because you have less control over a real-life setting with ordinary events going on all round you. 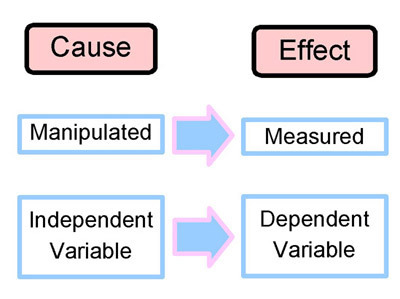 Although controls increase the internal validity of a study by reducing confounding variables, they can have the effect of lowering the external validity just as much. In particular, highly controlled experiments can lack ecological validity if the setting or the task become too unfamiliar or artificial. This is a trade-off between internal and external validity that all psychologists must make. One type of extraneous variable that gets special mention is demand characteristics. This is when participants behave unnaturally because they believe they know the purpose of the research they are taking part in. Martin Orne (1962) coined this phrase when he pointed out how people are naturally curious and in an experiment they tend to wonder what it’s all about. If people think they’ve figured out what the purpose of the experiment is, the temptation is to be “good participants” and make the experiment successful. Other people are awkward customers and, when they think they know what the experiment’s about, they try to ruin it. This is what Phil Banyard (2001) calls the “Screw You” Effect - another type of demand chaacteristics. Demand characteristics lower the internal validity (because something other than the IV is causing the DV) and external validity (because these people wouldn't behave that way in real life) as well as the predictive validity (because you can't predict future behaviour from unnatural behaviour). Naïve participants do not realise they are in a study - or if they do know they are in a study, they have been misled about what it's really all about. Misdirection is an experimental control that reduces demand characteristics but it raised ethical problems because the naïve participants cannot give informed consent if they've been misled about the point of the study. Don't confuse demand characteristics with social desirability bias. SDB is when people behave differently because they know they are being watched and their sense of what's socially appropriate comes into play: they are on "best behaviour". This is a problem if you arec trying to study antisocial behaviour (such as aggression). If you observe people in secret you may avoid SDB but that also raises ethical issues. Controlling variables is particularly important in the experimental method and the correlational method. Even researchers carrying out pure observations and self reports will want to keep extraneous variables to a minimum. However, this isn't easy. In general, there is a conflict between internal and external validity when it comes to controlling extraneous variables. If you strictly control extraneous variables, you increase internal validity, but you probably create an artificial situation which has low external validity. If you leave extraneous variables alone, the internal validity suffers but the external validity may be much higher, because the situation will seem less artificial. Psychologists aren't always consistent in how they use terms. External validity and ECOLOGICAL VALIDITY are very similar. In fact, ecological validity is a special type of external validity. External validity is about whether you can generalise the findings to the outside world; ecological validity is how much the study itself actually resembles the real world. So it's possible for a study to have external validity even if it doesn't have ecological validity (eg brain scans, memory tests). Cognitive Psychology studies mental processes and has to be particularly careful about operationalising independent variables (IVs). Many Cognitive studies find clever ways of teasing apart the subtle differences in memory and experience. For example, Baddeley (1966b) separates LTM from STM by using inteference tasks to "block" STM and then lists of similar words to separate Semantic LTM from Acoustic LTM. Other studies go about measuring the DV in a more straightforward way. Milgram (1963) operationalises "obedience" as the maximum voltage a person would deliver shocks to, with 450V being "complete obedience". This is easy to measure and observe but perhaps lacks external validity. Behaviourism is a school of Psychology from the 20th century that took a strong view about operationalising dependent variables (DVs). Behaviourists like B.F. Skinner argued that psychologists have no business studying DVs that can't be empirically observed. So, for behaviourists, mental processes (feelings, thoughts, fears, desires) have no place in Psychology and instead they only studied observable behaviour. A good example of this is Watson & Rayner's study of Little Albert: instead of studying Albert's fear, the researcher's recorded his behaviour of turning away from the rat, covering his eyes, crying, etc. These days, the Behaviourist approach is out of fashion and seen as too strict. You can operationalise variables even if you can't physically observe them happening. For example, Becker et al. (2002) operationalise "unhealthy body-image and possible eating disorders" as scores >20 on the EAT-26 questionnaire. Field experiments and unstructured observations and interviews are much harder to control. For example, in Sherif et al. 's Robbers Cave study, it wasn't possible to "script" how the camp counselors talked to the boys or covertly record everything they said to each other. They had to "make it up as they went along". Nonetheless, Sherif tried to introduce some controls: he told the boys' parents not to visit them at camp (remove one set of extraneous variables) and the counselors were instruct not to advise the boys about what to do, just to help them once they had made a decision. Experimenter effects only really disappear with a covert observation and not even then. For example, the children in Bandura's Bobo Doll study did not know they were being observed from behind a one-way mirror, but there may still have been demand characteristics because inflatable 'Bobo Dolls' are toys designed to be punched so the children may have assumed they were meant to be aggressive towards the toy. Similarly, Gina Perry's criticism of Milgram suggests that many participants realised this was a study into obedience and they were supposed to go along with it because nobody was really being hurt. It's also possible that the schoolgirls in Becker's study into the influence of TV figured out that the researchers were interested in the bad influence of TV on dieting and gave cthe sort of answers on the EAT-26 questionnaire that they thought the researchers were looking for: that TV was a bad influence, that they worried about their weight, that they wanted to be thin. However, these studies also try to reduce experimenyter effects. Milgram didn't play the part of the experimenter in his own study: he got someone else (Jack Williams) to be the experimenter instead and gave him a script to follow. Bandura also scripted the behaviour for his actors and the only person who spoke to the students was their nursery teacher, not Bandura himself. Experimenter effects were the very thing that alerted Pavlov to conditioning in dogs: the dogs started salivating at the sound of the researchers' footsteps. To remove these effects, he created a special sealed box to keep the dogs in where they would only be exposed to the stimuli he wanted to expose them to. A 8-mark “apply” question awards 4 marks for describing the use of controls (AO1) and 4 marks for applying the Cognitive Approach to this (AO2). You need a conclusion to get a mark in the top band (7-8 marks). "Experimental controls" turn up in the Specification for the Cognitive Approach but you need to know thow controls are used in all the Approaches. The Cognitive approach uses lab experiments which make use of controls to increase their internal validity. Controls include things like following standardised procedures, scripting all interactions with participants and setting the experiment in a controlled environment. Controls are supposed to stop extraneous variables from interfering with the DV so that you can tell if the IV is causing the DV to change. Controlling variables too tightly can make the research low in external validity because it becomes too artificial. An example of controls in a Cognitive lab experiment would be Baddeley using a slideshow to show his participants the same words for exactly 3 seconds. Baddeley also followed a standardised procedure did the same interference task, which involved remembering a set of numbers. This control prevented STM from affecting the results of the recall test because Baddeley was only interested in LTM. Cogntive studies like Baddeley's become quite artificial because learning lists of unconnected words isn't a realistic thing to do. The Cognitive Approach uses controls to test mental processes like memory that aren't usually observable. Behaviourists would say they should focus on behaviour instead of cognitions, because that's easier to observe and control. Notice that for a 8-mark answer you don’t have to include everything about controls. I haven’t mentioned demand characteristics or experimenter effects. But it is a balanced answer - half description, half application.